Very interesting study! My only question is why the women perform significantly worse than men in the control group. That doesn’t seem correct. I wonder if they validated that data? They actually have a few sources that show that men typically outperform women in physics, and I think they had some data from this specific class in previous years. Plus they sort of situate the claim that women are at a disadvantage by pointing out the gender gap in STEM professions in general (not that this is indicative of women having a lower potential, but at least that an intervention focused on women is warranted). They would claim that the pressure of the stereotype causes the women in the control group to do worse than their male peers. Not sure that I buy into that explanation 100%, but I do think that result’s valid. That’s very cool that some classmates got to try this out! I agree that if women do need some sort of pep talk to perform comparably to men, we have a BIG problem. I could see this extending into physical realms too- maybe female athletes or firefighters might underperform when they’re in an environment with men? And maybe male chefs and nurses would benefit from the same confidence-boosting intervention? It’s cool that we’re learning that these interventions are helpful, but the next step is figuring out a solution that doesn’t require intervention! Constantly reminding women that they’re as good as men seems like that could be detrimental too – after all, if someone feels the need to point out that I’m as good as someone else, it might be reinforcing the idea that there’s something different about us too. We still have quite a ways to go, I guess. 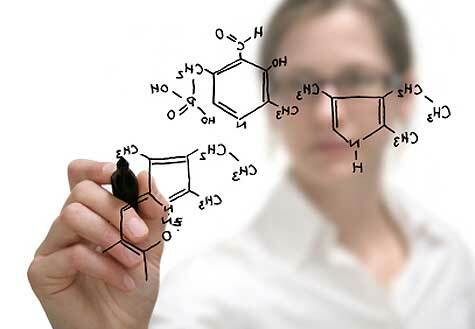 In your study above, affirming values provided protection from stereotypes that women aren’t as competent in STEM fields. As for a better explanation, it is perhaps better explained by Sian Beilock in Choke. I believe she talked about a study where black students were dealing with stereotypes that blacks aren’t as intelligent (the test would say, “This test you will take is an indication of a person’s intelligence”). Affirming values was done with a control and experimental group, just like you said above. 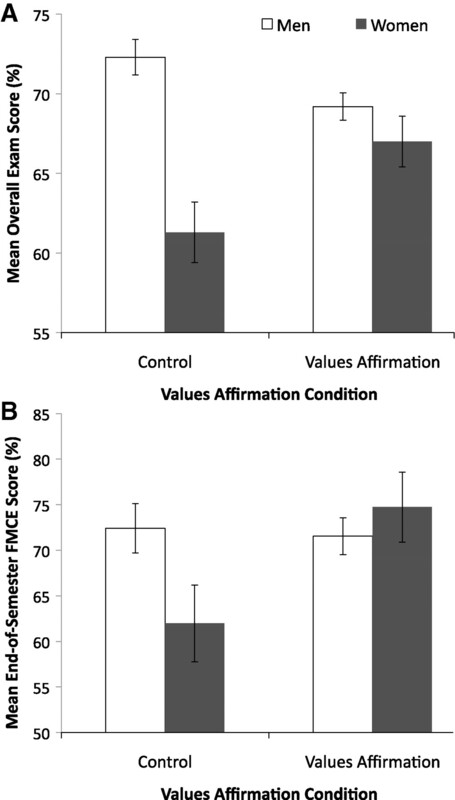 And the affirmed-values group scored much higher than the control group, at a level comparable to those who never had to deal with stereotypes in the first place. Beilock’s explanation was that affirming one’s values gave one a strong sense of identity. Like, I am this person who values such and such (honesty, treating others kindly, etc.) and there is much more to my life than how I perform on this one test. OUTCOME INDEPENDENCE thus freed their mental headspace from worrying about possibly confirming or proving wrong the stereotypes. This allowed them to fully concentrate their mental energies on the test at hand. This is the so-called protection from stereotypes that you said- freedom from worrying about confirming or proving that they’re real. I don’t know if there was a particular study done on this but I believe Beilock also said that athletes who affirm their values in this manner, before a big game, will choke less. There’s just more to life than whether or not they sink that game-winning shot.